I came across an interesting little program the other day. It's called Go. It's a Python script for quickly navigating directories via what are essentially command-line shortcuts. I discovered it while perusing the settings in my Komodo Edit preferences - it was mentioned in the settings for the Fast Open extension, which I believe is included by default as of Komodo 5.1. The beautiful thing about Go is how simple it is. You run a simple command to set an alias and from there on out, you can just type go alias and it will change you to that directory. 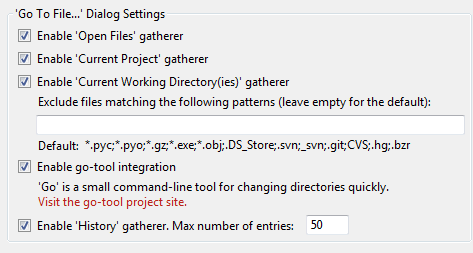 You can also add paths after the alias, such as go alias/dir1/dir2 to switch to a subdirectory of the alias. Great for switching between deep hierarchies, like how Windows programs like to bury things three levels under your "Documents" directory. However, as I played around with Go, I did come across a few annoyances. The biggest one, or course, was that it didn't work under Powershell. The go.bat wrapper script would run...and do nothing. The current directory stayed the same. Turns out this was because go uses a driver-based system for changing directory which is based on your current shell. The Windows driver was using batch file syntax and running cmd.exe. Powershell does this in a new process, so naturally the current directory wasn't changing. Added built-in shortcut "-" pointing to the OLDPWD environment variable. On Windows, Go handles setting this variable (on UNIX, "cd" takes care of that). When invoked without any argument, change to home directory. Resolve unique prefixes of shortcut, e.g "pr" resolves to "projects" if there's no other shortcut starting with "pr". Made -o option work without having the win32api bindings installed. Below are a patch file for the official Go 1.2.1 release (apply with patch -p2 < go-posh.patch) as well as a fully patched setup archive for those who just want to get up and running. Note that, to enable Powershell support, prior to running the Go setup, you'll need to set the SHELL environment variable so that Go knows to use Powershell. You can do this by adding $env:SHELL = "powershell" to your Powershell profile script. Edit: Fixed support for "-" so that it actually works like it does in UNIX. Edit again: I've added a few more small features and also created a project for this patch in my bug tracker. Enter the sum of 100 and 94.